Circa 500 BC, the Mediterranean was a hot bed of activity. Mainland Greeks and Ionian Greeks in Asia Minor were aggressively colonizing the northern coastlines near Italy and Sicily. The city-state of Carthage was doing the same along the Northern Coast of Africa. Carthage was originally a colony planted by Phoenician traders. Not surprisingly, friction developed as the different factions vied for optimum lands and ports. Sicilian Greeks and Carthaginians engaged in a major war in the fall of 480 BC. This was exactly the same time as the famous sea battle of Salamis occurred, where the Athenian Navy routed the Persian Armada and ended the Persian threat to Greece permanently. 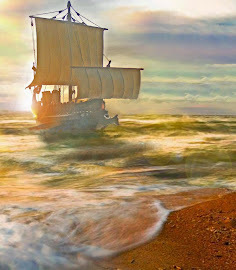 As you read about this era, you come to the realization that Greeks, Phoenicians, and Carthaginians were people of the sea. Their culture, trade, and prosperity were tied directly to their success at mastering the Mediterranean. Most movies and books depict famous land battles, the siege of Troy, defense at Thermopylae or battle of Marathon where armies faced off and battled, shield against shield, standing on hard ground. But think about it. Jason, Agamemnon, and Odysseus were really pirates in the purest sense of the term. Most myths place gods and heros on islands spanning the entire Mediterranean: Zeus was born on Crete, Cyclops lived on Sicily, Hercules’ golden apples and Atlas were located at the straits of Gibraltar. The lives of these people centered around the sea. Countries like Greece had little arable land to grow crops, few minerals and limited forests for timber. They could not support themselves without sea trade. Eldest sons inherited property leaving few opportunities for younger generations to expand. A simple way to remedy these problems were to load ships with colonists and send them off to a "New World”; just like Eric the Red settled Iceland or Pilgrims settled Jamestown. The western Mediterranean and beyond held as much opportunity and promise for Phoenicians and Greeks as the Americas held for European colonists. This is why Hanno of Carthage, a high ranking prince, was commissioned to take sixty warships loaded with colonists through the Pillars of Hercules and settle lands along the Moroccan coast. His trip was so awe inspiring for its time that the details were inscribed into a bronze plaque that became famous and was posted on the Temple of Ba’al in the center of Carthage. The original bronze plate has been lost, but a single Byzantine copy, translated into Greek, managed to survive. It is titled Hanno’s Periplus and resides in the University of Heidleberg. It is hard for modern scholars to figure out exactly where Hanno traveled, because descriptions changed with each version of the original document and place names change as different cultures exert their influence over the various regions. Even Pliny the Elder, the famous Roman Historian, complained of writers committing errors and adding their own descriptions concerning Hanno’s journey, a bit ironic considering that Romans leveled the temple of Ba’al losing the famous plaque forever. Generally, it is agreed that Hanno established seven colonies along the Moroccan coast. The last colony was on the island of Herne. Sailing south of there was where his adventure into totally unexplored territory commenced. Probably on the Senegal River, he encounters savage tribes, a burning mountain that was probably Mt. Cameroon, and hairy man-like creatures. These dark hairy men scattered into the hills, but he managed to capture three women and promptly flayed them and brought the skins back to Carthage. He called them gorillae and this is were our name for gorillas originated. When we had passed the Pillars on our voyage, and had sailed beyond them for two days, we founded the first city which we named Thymiaterius]. Below it lay an extensive plain. Proceeding thence towards the west, we came to Soloeis, a promontory of Libya, a place thickly covered with trees, where we erected a temple to Neptune; and again proceeded for the space of half a day towards the east, until we arrived at a lake lying not far from the sea. and filled with abundance of large reeds. Here elephants, and a great number of other wild beasts, were feeding. Having passed the lake about a day s sail, we founded cities near the sea, called Cariconticos, and Gytte, and Acra, and Melitta, and Arambys.Thence we came to the great river Lixus, which flows from Libya. On its banks the Lixitae, a shepherd tribe, were feeding flocks, amongst whom we continued some time on friendly terms. Beyond the Lixitae dwelt the inhospitable Ethiopians, who pasture a wild country intersected by large mountains, from which they say the river Lixus flows. In the neighbourhood of the mountains lived the Troglodytae, men of various appearances, whom the Lixitae described as swifter in running than horses. Having procured interpreters from them, we coasted along a desert country towards the south two days. Thence we proceeded towards the east the course of a day. Here we found in a recess of a certain bay a small island, containing a circle of five stadia, where we settled a colony, and called it Cerne. We judged from our voyage that this place lay in a direct line with Carthage; for the length of our voyage from Carthage to the Pillars, was equal to that from the Pillars to Cerne. 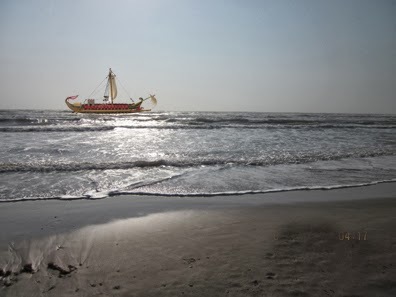 Thence we sailed towards the south twelve days, coasting the shore, the whole of which is inhabited by Ethiopians, who would not wait our approach, but fled from us. Their language was not intelligible even to the Lixitae who were with us. Towards the last day we approached some large mountains covered with trees, the wood of which was sweet-scented and variegated. Having sailed by these mountains for two days, we came to an immense opening of the sea; on each side of which, towards the continent, was a plain; from which we saw by night fire arising at intervals in all directions, either more or less. Having taken in water there, we sailed forwards five days near the land, until we came to a large bay, which our interpreters informed us was called the Western Horn. In this was a large island, and in the island a saltwater lake, and in this another island, where, when we had landed, we could discover nothing in the daytime except trees; but in the night we saw many fires burning, and heard the sound of pipes, cymbals, drums, and confused shouts. We were then afraid, and our diviners ordered us to abandon the island. Sailing quickly away thence we passed a country burning with fires and perfumes; and streams of fire supplied from it fell into the sea. The country was impassable on account of the heat. We sailed quickly thence, being much terrified; and passing on for four days, we discovered at night a country full of fire. In the middle was a lofty fire, larger than the rest, which seemed to touch the stars. When day came we discovered it to be a large hill, called the Chariot of the Gods. On the third day after our departure thence, having sailed by those streams of fire, we arrived at a bay called the Southern Horn; at the bottom of which lay an island like the former, having a lake, and in this lake another island, full of savage people, the greater part of whom were women, whose bodies were hairy, and whom our interpreters called Gorillae. Though we pursued the men we could not seize any of them; but all fled from us, escaping over the precipices, and defending themselves with stones. Three women were however taken; but they attacked their conductors with their teeth and hands, and could not be prevailed upon to accompany us. Having killed them, we flayed them, and brought their skins with us to Carthage. We did not sail farther on, our provisions failing us.